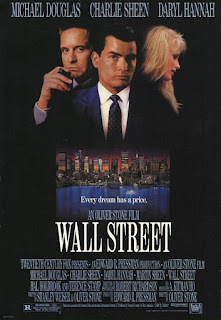 Recently I watched this legendary movie entitled Wall Street. Story of a young stock broker who in the beginning of this film was struggling but got hooked up with the right connection and suddenly was rising high. It came at a cost however when he finds himself getting arrested for insider trading right after he pulled a fast one on his connection. The message of this movie was regarding greed or at least the 1980s version of greedy excess. 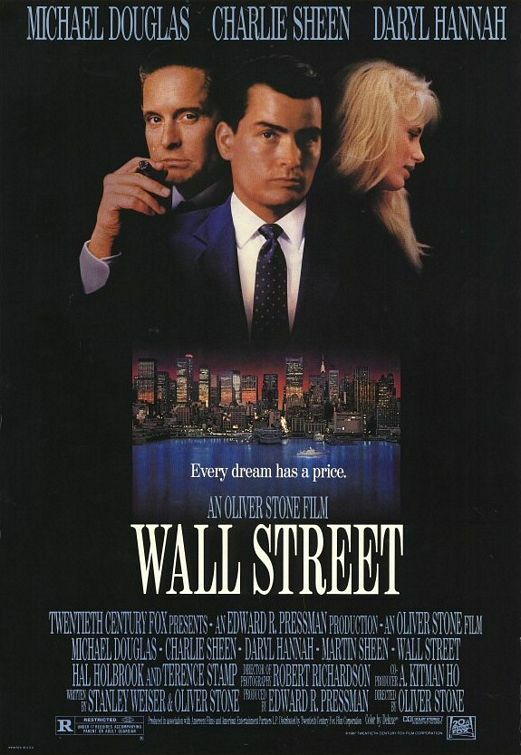 Charlie Sheen played Bud the young stock broker and Gordon was played by Michael Douglass who was Bud's connection into the higher echelons of the financial world. Bud had it all, but he decided to pull a fast one on Gordon when he found out what Gordon attempted to do! A friend shared the film with me to show how it goes in corporate America. I really laughed when Bud was arrested in his office, the man who gave him the office went from "I knew you were something special" to "I always knew you were trouble". Turned his back on him just like that! I don't necessarily look down on greed, but certainly we would look at a personally differently if they did whatever they could to get more. We could be talking about money and we could be talking about food. It could be anything that is very necessary. My friend and I have talked about how today's titans take care of themselves and then forget about the people who toil under them. The titans may live in expensive pieces of real estate while the people under them may never get that luxury. Then the question comes up - How much is enough? Everyone has an answer. We could talk about wealth and say you don't need two or more houses. We could also say you don't need all that money. The question is who are we to decide who has enough. The ones who are asking the questions about having enough wealth has very little themselves. I could aspire to be a Mitt Romney although I have no idea if I'll ever get there. My aspirations isn't necessary regarding wealth, but certainly regarding attaining the middle-class lifestyle that I grew up in. To be comfortable enough to not be force to scrimp and save ever dime I earn. It seems easier said than done, I'm sure but it is what it is. While it seems as if the past election was about the economy, the past election was about a rich man running for president. It wasn't Romney's time for that reason especially in an environment where we're asking the question about how much is enough. Obama had ads up about the rich paying their "fair share" of taxes and there are people out there who have buttons stating "tax the rich". BTW, since I mentioned Wall Street there was a sequel release in 2010 called Wall Street: Money Never Sleeps. An interesting update and certainly mentions today's young people's issues with regards to their debts. It could have been an update that addresses the real estate bubble but it doesn't appear to do that although it does touch upon some of the themes of the original. It makes me wonder if there is a film today that could show the times we live in. One film comes to mind entitled The Company Men. People getting laid off so that the executives in the higher eschelons can think more about themselves than those under them. Surely there are other examples than that. Still while I may continue to have faith in this system we call capitalism, sometimes we do have to take note of its various downsides.